November 19, 2018 – Our time machine hauls out the big, bulky Speed Graphic camera and watches the ultimate watcher of watchers in 1930s, ’40s and ’50s New York City: Arthur Fellig. 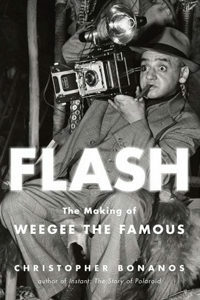 Helping haul the tripod around to various crime scenes and disasters is Christopher Bonanos who brings us Flash: The Making of Weegee the Famous . Even if you don’t know the name, you’ve seen his gritty images from the 1930s through ’50s. It’s an incredible body of work produced by a photographer who hammed up claims of an uncanny ability to show up at a crime scene just as the cops did — a human Ouija board. Christopher Bonanos is city editor at New York magazine where he covers arts and culture and urban affairs. His previous book is Instant: The Story of Polaroid . Follow him on Twitter @HeyBonanos and @PolaroidLand on Instagram.